In the course of Holmes's mad recycling of the past, however, Holmes fires off one of the most fascinatingly problematic concepts in the history of Doctor Who, namely the idea that the Time Lords eventually yank Earth and its "constellation" out of place in the galaxy and plop it down elsewhere. The use of the word constellation is interesting. It's a chronic foible of Holmes that he seems to use the word as a synonym for "solar system," but the error is almost the perfect Holmesian error. The nature of a constellation, after all, is that it makes sense only from a set physical vantage point. The constellations of one solar system are not the constellations of another. And yet the Doctor routinely identifies Gallifrey with reference to its constellation. Tellingly, though, the constellation he names - Kasterborous - cannot be a Gallifreyan one, since constellations are merely happenstance arrangements of stars in the sky of a given planet, and thus one cannot see a constellation that one is a part of. So when Gallifrey is said to be in the constellation of Kasterborous, what can this possibly mean? Clearly, and this ties in alarmingly well with Gallifrey as we understood it back in The Deadly Assassin, the Time Lords' understanding of themselves is defined primarily by reference to an external observer. They are, after all, seemingly a race governed not by the recorded facts of history but by the material memory of history. Their entire civilization is based around the Matrix, known to be a collection of memories. So it's not a surprise that even the location of their planet is defined in terms of an external perspective. The only question is whose. By far the most sensible answer, within Doctor Who, is Earth's. Yes, there's a sort of dreary cliche to the idea that the Time Lords are future versions of humanity, but it's also difficult to avoid the fact that it makes a lot of sense. Not, as Miles and Woods sneer, because the sorts of people who like this idea are the sorts of people who want the Doctor to be Anakin Skywalker's father, but because some version of this is already true. The series is hopeless at making up its mind whether the Time Lords consider Earth an obscure backwater or whether they see it as a vitally important planet, but it's difficult not to observe that Earth has been the obsession of every single renegade Time Lord in the series from the Monk on. Part of this may simply be geopolitical. Clearly there comes a point where Earth is the dominant force in the galaxy. In that regard, the Time Lords would, in any conception of them, have a lot of investment there. But the Time Lords seem almost wholly unconcerned with, say, Draconia. None of the other vast conquering species besides the Daleks raise much of an eyebrow. The Time Lord fascination with Earth exceeds mere local politics. After all, we remain at least somewhat committed to the idea of the Time Lords as guardians of the arc of history. But if pressed on whose history, exactly, we'd be forced to confess that we are ourselves the most likely suspects here. This is inevitable - after all, its humans writing the series, and so a human conception of history that drives things. And indeed, if we really want to be particular about it, this is inevitable simply because its true. The Time Lords really do exist and understand themselves only through our eyes. But let's pull this thread a little further. The Time Lords at large seem at best marginally aware of Earth (again as evidenced by The Deadly Assassin), which is strange given that their politics are flagrantly a reenactment of the Kennedy assassination in that story. But renegade Time Lords are all obsessed with the place. Something about renegade status, in other words, seems to involve an awareness of the fact that the Time Lords are inherently linked to human perspective. (If we take the meta-fictional truth of this seriously then it is perhaps telling that The Mind Robber, along with implying that the Doctor is an exile from the Land of Fiction, inadvertently gestures forward and implies the Master's presence there as well.) But on Gallifrey itself this seems to be more secret knowledge. But let's return to Trial specifically. Of the many bits of dodgy explanation to be offered in the course of Trial, the Time Lords' supposed logic in moving Earth around is by far the strangest. Surely options less extreme and scandalous existed to deal with the seemingly minor problem they were actually facing. Moving a planet in lieu of chasing down some thieves you know where are is just strange. Here it's worth thinking again about the fact that Earth's entire constellation is moved. In other words, the shape of it within the Gallifreyan sky is maintained with a seemingly slight positional change. But from an Earthbound perspective the difference is more significant - the entire sky would change. And the Earthbound perspective is how the location of Gallifrey is understood. In other words, moving Earth's constellation would be nothing short of a covert redefinition of the entirety of Time Lord culture - the most fundamental social revolution imaginable, done as a complete secret. No wonder the coverup was such a big deal. Part 2: The Story That Didn't Happen? Indeed, in the end the only escape the story can muster from its own critique is the idea that it never happened. This is emphasized twice over. First of all, we're told throughout the story that the Doctor's actions are being misrepresented. Second, we're told at the end of the Trial as a whole that the story's grand crescendo, Peri's death, was all a fabrication and that Peri is fine. (Well. Ish. But that's for later in the entry.) What we're left with is an oddity in Doctor Who - a story defined primarily by the fact that it never happened. But what's really interesting here is the idea of a story that is on the one hand televised Doctor Who (and thus "canonical" by even the strictest of definitions not to be willfully silly) that never happened. Doctor Who has not previously engaged in the idea of an unreliable narrator like this, and it won't again until the Silence start complicating matters. Above all, however, it is fitting that this happens in the segment of the story designated as the "present." Trial of a Time Lord exists in place of the Seasonish, and the one story that ostensibly exists within its timeframe is itself ished and left ambiguous as to its very existence. This is, in short, the point where the Trial begins to fall apart as a coherent narrative. Part 3: What Is The Future? Even as Terror of the Vervoids descends into incoherent mess, however, there are interesting interpretations to be made of it. The biggest bit of intensive wonkiness to come out of Terror of the Vervoids is the idea of the Doctor reviewing the events of a future adventure. But as bits of head-scratching incoherence in Doctor Who go, there are few bits more generative of strange implications. Let's start big here with predestination. Doctor Who has typically been pretty strongly pro-free will. Even in the new series, when things get intensively timey-wimey, the show constantly stresses the ability to change and reshape the wime. So given that, it's difficult to even begin to make headway into the idea of the Doctor casually reviewing his future adventures. And presumably he did have to review a decent number - I mean, one doubts he just plunged into his future, grabbed an adventure at random, and said "oh, this will do." So how, exactly, can this be squared away with the series more general embrace of free will? I mean, it's one thing for the Doctor to know vaguely what his future incarnations look like and one of his adventures. It's another to systematically peruse them. But wait, there's a bigger issue here. The Matrix contains the minds of past Time Lords. We've been told repeatedly that we're watching the psychic impressions of the TARDIS. So why the heck does the Matrix have access to this adventure in the first place? Short of completely abandoning the idea that Time Lords have any sense of the present - a viewpoint that is irreconcilable with everything else we've ever seen of them - there's no way to figure out how this would work. Unless, of course, these aren't the Doctor's Time Lords. After all, the presence of the Valeyard does necessitate that the Doctor is out of his own personal timeline here. The question is purely whether the Valeyard is meddling with the past of Gallifrey or whether the Doctor is being yanked around by a future Gallifrey. The fact that the Doctor's future adventures are known to these Time Lords suggests very strongly that it's the latter - that this is a Gallifrey from several incarnations in the Doctor's future. Indeed, future events in the series even make it fairly easy to peg when in the future it is. We're jumping the gun a little bit here, but one thing we'll notice when we get around to the new series is that the Time War is in part a metaphor for the program's cancellation and the resulting loss of a unified or master text. Given this, and given the Trial's necessary engagement with the Seasonish, there's every reason to treat Trial as an early echo of the Time War. So what we have is, in effect, the future of the series attempting to rewrite its past. Or, more accurately, its present. And by necessity, at least some of this rewriting takes. The Valeyard may be defeated at the end, but that doesn't mean that the Doctor's narrative doesn't shift. Aside from handily resolving the mess of continuity errors introduced by the Trial, this has the exceedingly useful benefit of providing a diegetic reason for the increase in quality that (slowly but surely) begins after the Trial. The future goes to the weakest point in the program and demands that it justify itself. And in response, the program begins to retune itself towards that future. It's November 29th, 1986. Berlin remain at number one, and are unseated for the final week of this story by Europe with The Final Countdown. Erasure and Debbie Harry also chart. Lower in the charts - we've not looked in some time, after all - are Genesis with "Land of Confusion," A-ha, Eurythmics, Simple Minds, and The Damned. Which paints a rosy picture, but we could also have done that by saying Bucks Fizz, Kenny Loggins, and Rod Stewart were in the lower charts, so, you know, let's not get carried away. While in real news, the first case of bovine spongiform encephalopathy, or, as we cheerily call it, Mad Cow Disease is diagnosed in British cattle, and preparations are made to offer shares of British Gas as the British natural gas industry gets privatized. While on television, Trial of a Time Lord finally wraps up. Throughout the preceding three entries we have been pursuing various theories as to what is actually going on in the Trial. And for the most part we've been relatively fortunate, in that the thematic implications of the Trial have managed to explain the on-screen events surprisingly well. The infelicities of Holmes's cosmic terminology play off of our established understanding of the Time Lords perfectly to produce a political situation where the apparent malfeasance of the Trial makes sense. The implications of the Doctor perusing future adventures perfectly sets up the bizarre contradictions within the story. We're clearly miles out of line with what anyone writing this intended, but we're nevertheless finding ourselves with a fairly easy interpretation of the entire trial as belonging to some hypothetical future period of the show that is at least partially averted by the revamp of the show that occurs in the Trial's wake. What remains, then, is understanding what this future timeline is like. Given that it is a future timeline, my readership will forgive me for actively cross-checking it with future stories, since I try not to discuss stories I've not covered yet at length. In any case, very few details present themselves. The Master is in his Tremas skinsuit still, suggesting that it predates the McGann movie. But we've also posited that this could be as far forward as the Time War, in which we know the Master was brought back to life, so presumably any version of the Master could do there. A better clue comes from the Inquisitor's claim that the Doctor was deposed as Lord President. But past those vague guideposts we're left without much mooring in terms of the when - which is, admittedly, unsurprising given that Gallifrey post-Five Doctors is a complex topic to say the least. But it's sufficient to observe that the Trial seems to take place somewhere in the hiatus - a period that, as I've already remarked, necessarily coincides with the Time War. Moving on from when, then, let's look at what. The first and most obvious thing to point out is that the setting of the Trial is strange. On the one hand it is clearly aboard a space station distant from Gallifrey. On the other the space station is clearly a place important enough to be the location of the Seventh Door to the Matrix. To be blunt about the question, then, where the heck is this place? The more interesting thing to point out, however, is that nobody on the station seems to have a name. Even the seeming representative of Gallifreyan authority, the Keeper of the Matrix, is a position we have never seen referred to before held by someone who lacks a name. We observed back in Mark of the Rani that there is an existent if inadvertent distinction within Time Lords between named exiles and nameless renegades. And so it is of considerable interest to note that the trial is comprised entirely of renegades. What is strange about renegades (as opposed to any other group of Time Lords) is that they are at once the lowest and the most powerful sorts of Time Lords. On the one hand they are wholly separate from Gallifreyan society, on the other they are continually uniquely privileged within it. The fact that the Doctor is put on trial by renegades speaks volumes and is one of the most intriguing details of the story. Especially when one thinks about how the renegades are privileged. For one thing, the only people we have ever seen to have a TARDIS in all of Doctor Who are renegades. Now we see that a space station full of renegades has one of the doors to the Matrix. And let's further note that in The Deadly Assassin entering the Matrix from Gallifrey is a dangerous and dodgy process involving machines. Similarly, communion with the Matrix in The Invasion of Time requires no end of danger and equipment. We've never seen anything like a door to the Matrix on Gallifrey, and prior to this story it was never viewed as one of the functions of the Key to Rassilon. The implication is that not only do the renegades have privileged access to the Matrix, they are in fact the true keepers of it. To be a renegade, in other words, is to be in a position of true authority - to be the driver of the eye of the Panopticon. And the Trial consists of them turning the Panopticon and all of their authority onto the Doctor in what we now understand as an explicit attempt to rewrite his history. At this point, then, we must finally turn to the question of who's doing this. Another excellent, thought provoking entry. Just to throw a concept in...The Tardis has the ability to archive both past and future control rooms (as seen in The Doctor's Wife) So it's no great stretch to imagine the Matrix, which post McGann seeems to have at least an annexe in the Tardis, being able to archive past, alternative present and potential future stories. The idea of diagetic narrative being the driving force of the Time Lords fits well with the whole Land of Fiction theory doesn't it? My money's on the Tardis. Again, in The Doctor's Wife' it's established that she 'stole' the Doctor in the first place. And only renegades have Tardises hmmm. Are the sentient Tardises the REAL Time Lords after all? although it seems a bit cut and dry, i wouldn't say that the Galifreyans aren't Time Lords as such, but that it's a symbiotic relationship. certainly this would explain their apparently un iversal trait of self importance, it exists to prevent such a necessarily clever species realizing that they are not fully in control. "Unless, of course, these aren't the Doctor's Time Lords. After all, the presence of the Valeyard does necessitate that the Doctor is out of his own personal timeline here.....whether the Doctor is being yanked around by a future Gallifrey. The fact that the Doctor's future adventures are known to these Time Lords suggests very strongly that it's the latter - that this is a Gallifrey from several incarnations in the Doctor's future.....there's every reason to treat Trial as an early echo of the Time War." Brilliant. This never occured to me, and I've watched this at least 8 times by now. Instead of The Valyard coming from the future to The Doctor's present, The Doctor is being yanked into his own future, which is The Valyard's present. And further-- the reason the Trial takes place on a space station? Because Gallifrey has ALREADY been destroyed!!!!! Which would indicate that it's destruction coincides with the point where no more renegades are needed (ah, how the diegetic meets the extra-diegetic), that is to say when The Doctor became the only Time Lord necessary for the continued smooth running of the universe. Not that The Doctor or his TARDIS seem happy at this state of affairs, nor Rassilon for that matter, so can we presume the Time War began as a suicide attack on the part of the TARDISes against Skaro? And how long have they been pushing that agenda, considering the repeated involvement of The Doctor in Dalek history? FWIW Philip, although it's never stated onscreen, in the "mission brief" to potential writers for "The Trial of a Time Lord," it's explicitly stated that both the Valeyard and the Inquisitor hail from Gallifrey's future. In a way, the Valeyard isn't a simple villain, but the articulation in the narrative of an ethical failure of the Doctor that can occur at vulnerable moments: when he acts on his authority as a Time Lord without the guidance of any of his ethical or moral principles. 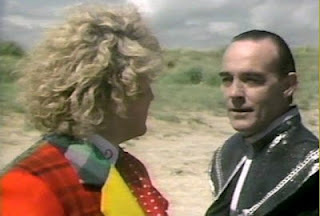 Any time he acts without concern for his own authority, he becomes — after a fashion — the Valeyard. So perhaps we can understand the Time Lord Victorious as another articulation of the Valeyard: a moment when the Doctor decides that his decisions are justified only by his making them. Henry: Now if we ever get the chance to talk to Russell T Davies, we have a clear question to ask him. Did the ideas behind Trial of a Time Lord inspire the concepts of the Time War? Although, I'm not sure if I ever want to hear his response. A definitive answer would end all the speculation I so enjoy. The sentient-TARDIS-as-true-mover-and-shaker-of-Time-Lord-Society theory is also strongly supported by Lawrence Miles' brilliant "Toy Story," collected in the Mad Norwegian edition of his similarly brilliant novel "Dead Romance," which I'd be shocked if Dr. Sandifer didn't cover when he reaches the year 1999 in his survey (perhaps next January or February if he expects to hit the film by Boxing Day), seeing as it's basically one version of the Time War. Regular commenters Flowers and Wilcock wrote about it for Hickey's Pep magazine a couple years back, doing the book (and the Time War) far more justice that I could ever hope to in their essay A Fractal History of the Time War. Now that the Trial entries are finished, has anyone else been madly scrolling back and forth to read them in the "correct" order? Ironically, one thing I got from this was that the given order isn't as disjointed as I'd thought reading through it normally, with a definite thematic unity to each entry. I've always been glad that unlike Lucas Licensing the BBC doesn't faff about with degrees of canon handed down from on high like commandments. That leaves Henry free to regard only the TV episodes as official, and me free to consider each and every licensed spin-off as official. Yes, even the Cadet Sweets cards. That à la carte flexibility is one of the things that I think makes Doctor Who very special. The idea that Trial of a Time Lord, a story that has never been referenced by anything else on screen ever, somehow counts for less than Love and War or The Highest Science, both of which were actively referenced by the new series, has always seemed to me to actively reject reality. Yes, yes I have. And I've been keeping track all the way through. To me, it reads something like this. Each post goes in the order Planet-Mindwarp-Vervoids-Foe. Reading each part of the individual interpretations of the stories in order (Planet 1-4, etc. ), you get four fairly traditional Eruditorum entries, touching on various themes as they appear in each story. The jumbled organization of the actual posts organizes them thematically. The concept of rewriting history appears at various points throughout, and this is probably the general concept in Phil's interpretation of Trial overall. However, in the presentation of the actual posts, the organizing ideas of each one focus on an aspect of the series starting with the petty particulars of the production staff in 1986, through Colin Baker as an actor and Doctor, then the Trial story itself, and ending with a perspective encompassing the whole series. It strikes me as similar to the articulation of orders of the universe from The Ribos Operation (Gods > Time Lords > Space Travellers > Ribos), only in the other direction. Post 1: The production staff rewrite their past mistakes, but only Holmes is fully aware of all the mistakes and understands the inadequacy of a staff so embedded in the past to fix them. The condescending perspective of Pip and Jane Baker show John Nathan-Turer's blindness to the ugliness implicit in his vision of the show. On the bright side, Holmes also created the conditions, throughout his tenure writing for Doctor Who, for the show to grow infinitely. Post 2: Examining the Doctor's character as a renegade. Rule-breaking is essential to his nature, but in Colin Baker's Doctor, he has a near-irredeemable downfall thanks to transgressing many of his own ethical and moral principles. Post 3: With regard to the structure of the story of the Trial itself, and what is actually going on, it's utterly incoherent. Phil explores several dimensions of this incoherence. The organizers of the trial have no sensible motives, the chronology of Mel is incurably twisted, the only way Holmes can think to write Doctor Who well is to throw his entire old toolbox at the screen hoping something will stick, and the Valeyard wants to rewrite the history of the Doctor so that it leads to him and the moral arbitrariness of his devotion to rules as rules alone. Post 4: This examines various aspects of the core organizing idea of Doctor Who that renegades are the true power of the show's universe. The Valeyard is a bad kind of renegade because he is devoted to rules with no organizing principles, so are capricious and arbitrary. The Doctor is critical of his own authority thanks to moral principles that he himself adopts, which allows him to be a good authority, one who always questions and justifies his legitimacy. Phil, you posted your short reply while I was writing this obsessively long reply. Now I feel a little awkward for having risked putting so many words in your mouth. I think you really meant to use "more", rather than "less" in that comment, Phil. Unless, of course, you intended the comment to be as incoherent as Trial. I tend to agree with the symbiotic arrangement, it's an idea I've held for some time. I suspected that somewhere in the off-air canon there'd be a similar theory but as I rarely bother with the novels etc. I was relying on some of you guys to confirm it. I used to eat a "Dalek's Death Ray" lolly every day after school, until I developed an incurable distaste for mint ice-cream. I have inwardly digested canon. I am canonical Doctor Who. Er...other than that, just to mention that the "Trial" series of posts has been a triumph from finish to start. Oh, and just to throw in an unsupported assertion: When television itself is on trial, the VCR makes us all the Valeyard. By the way, Phil. I just remembered a long time ago when you wrote that Robert Holmes wrote the debut of five companions. You didn't enumerate them, but made a throwaway joke about how that count really did work. There was Liz Shaw in Spearhead from Space, Jo Grant in Terror of the Autons, Sarah Jane Smith in The Time Warrior, Romana in The Ribos Operation. Did you count Mel in the first episode of The Ultimate Foe? Probably, since it was filmed before Terror of the Vervoids and since, as I noted, it is obviously in practice the beginning of the Doctor traveling with Mel (given how the story ends). Though there's an outside chance I meant Mike Yates. To be fair, Phil, wasn't "The Highest Science" going to be made into one of the '09 Specials around the time Moffat wrote that? I don't think the timeline would work for that - the line was all the way up in The Pandorica Opens, which had its readthrough a few weeks after End of Time had aired, and a full year after Planet of the Dead had shot. Thanks for the exegesis of Phil's Trial series. I was thinking of going back to identify the unifying themes, but it all seemed a bit of a jumble, much like Trial itself, but I'm glad it's actually an anti-Trial with all kinds of coherency. Just goes to show that the problems with Trial aren't necessarily due to the obvious aspects of its anomalous temporal structure. I thought he meant K9 Mk II. Oh, I might have done! I'm not sure how well this theory works, but if these are Time Lords from the Doctor's future - and taking into account Time Lords' narrative perception of events - one simple rule might be enough to explain why the trial takes place off Gallifrey: Time Lords always arrive on Gallifrey in sequence. By which I mean that when returning to Gallifrey from elsewhere in the universe, they will always arrive after the last time they left. Now, there may be books that contradict this, since I've not read many; but when the Doctor encounters future Time Lords (in Alien Bodies, for example) it is always off Gallifrey. In The Apocalypse Element he meets President Romana offworld and she comments that they are meeting out of order, but when they go home they arrive at a point appropriate to her, being the Time Lord furthest along the Gallifreyan timestream. So, if the Valeyard had summoned the Doctor to Gallifrey Sixie would have arrived far up the Gallifreyan timestream, potentially messing up the Valeyard's own past - which he couldn't allow. Hmmmmm... well, I think things have clicked into place on something else, now, for me; the situation with "The Doctor's Wife"/"The Lodger" was exceedingly similar to that back in 1980 with "Sealed Orders"/"Warrior's Gate", albeit for different reasons -- end-of-season costs for the former, format difficulties (Priest transferring from books to teleplays) for the latter. Well, I’ve finally had time to read all your Trial entries, forwards and backwards, inside and out, and they’re something of a triumph – though, obviously, by now you’ve moved on to a far better Colin story (arguably both his and Big Finish’s best). I loved the making sense of the use of the word “constellation”. I wish it was that thought out, but it’s a lovely idea (and very in tune with the likes of The Book of the War, obviously). I liked your using the Valeyard to head every entry, too; I’ve always thought of him as the ‘director’ of the story. I’m not sure your idea (and a terrific one) of him as the Doctor gone bad because he’s suddenly embracing all the rules fits with the idea of a court made up of renegades, though. And there’s a case to be made that he’s not the villain at all. The idea that Trial of a Time Lord, a story that has never been referenced by anything else on screen ever, somehow counts for [more] than Love and War or The Highest Science, both of which were actively referenced by the new series, has always seemed to me to actively reject reality. Obviously, I’d pay more attention to the New Adventures anyway, though. So a case can be made for seven? Not for the first time it appears that the Time Lords have no conception of events except as narrative. Which of course, is why the founder of their society is later reinvented as the Narrator!